The beginning of 2017 has not been a favourable time for Bell Pottinger, a UK-based PR firm that was commissioned to save the reputation and improve the public appearance of President Jacob Zuma and the Gupta family. 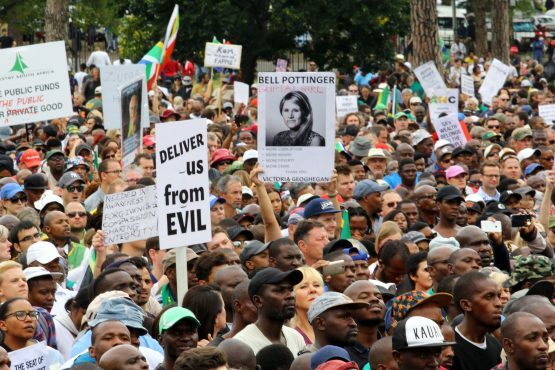 On Saturday the 15th of April 2017, thousands of South Africans took to High Holborn to protest outside of the Bell Pottinger head office, demanding that Bell Pottinger cuts all ties with the Gupta family. They also demanded that the PR firm gives back the money they’ve earned at the expense of South Africans. Bell Pottinger ran an extensive – albeit ineffective – social media campaign to cause mayhem in our country. Their campaign consisted of numerous fake organisations, news websites, blogs and twitter accounts. All of which were aimed at defending the Gupta family and causing a racial divide amongst South Africans. Their campaign focused on turning the tables on those who have accused the Gupta family of “state capture”, while also accusing billionaire Johann Rupert of being the face of “white monopoly capital”. Even though the UK-based PR company had recently cut all ties with the Gupta-owned Oakbay Investment Group, protesters believe that there are more Gupta contracts that remain in place. While the UK has been experiencing their own political turmoil due to Brexit, it makes no sense for a UK-based company to try and disrupt South Africa in hopes of defending the people who have tried to break our country down. Do you think that Bell Pottinger would return the money? If so, what do you suggest our government does with the money?